Scientists from James Cook University have made a breakthrough in the breeding and raising of saltwater aquarium fish and crustaceans that will take the pressure off hard-pressed coral reef populations. JCU’s Associate Professor Chaoshu Zeng said the trade in marine aquarium fish is a fast expanding, multi-billion dollar industry, with the exotic creatures collected from reefs pound-for-pound the most valuable commodity in the world. But he said developing nations such as Indonesia and the Philippines, which provide the bulk of the supply, had little effective control over their collection, with chemicals such as cyanide often used to stun fish so they could be captured, and coral reefs destroyed to scare them into the open. Dr Zeng said through many years of hard work, JCU researchers had made multiple breakthroughs in the notoriously hard science of breeding and raising marine ornamentals. He said a combination of confidential techniques had allowed JCU to raise more than 20 marine ornamental species, including the Harlequin Anemone Crab (a world-first), the Dot-dash Lined Cleaner Shrimp (which can retail for around $100 each), the coral sea lyretail Blenny, and the chocolate goby fish. Dr Zeng said the team had also recently successfully raised Fire or Blood Shrimp for the first time in Australia with the best survival and quickest larval settlement in the world. The crustacean is a much sought-after variety that can be sold for nearly $300 each in Australia. 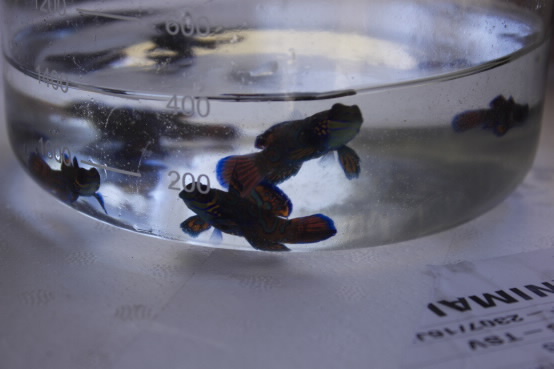 He said they also had much success with the colourful Green Mandarin Dragonet fish, achieving the highest survival rate of captive-bred examples of the species in the world. Dr Zeng said the project was on the cusp of being commercially viable.